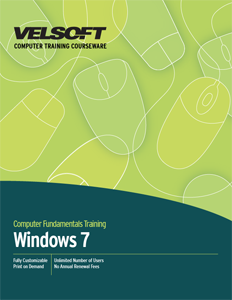 Windows 7 Intermediate Training Materials are designed for trainers to teach Windows desktop skills at an intermediate level in the workplace. Train your employees how to use gadgets, advanced taskbar options, file management and more! Seeing is Believing This sample manual to teach Windows 7 - Intermediate is in MS Word format. So now you have Microsoft's Windows 7 installed on your computer. What now? The next level in Trainingmaterials.com Windows 7 courseware contains material on how to teach others even more about the operating system. Give those in attendance a deeper knowledge. Of the many topics covered in the intermediate level, some examples are the Windows Media Center, Windows DVD maker, and the search function. Microsoft has really outdone themselves with Windows 7, and Trainingmaterial.com has kept right on track by developing professional training materials. And the best part of the courseware is that it's completely customizable to fit your needs. Print as many as you need, when you need because it's all print-on-demand! Start training Windows 7 Intermediate today!